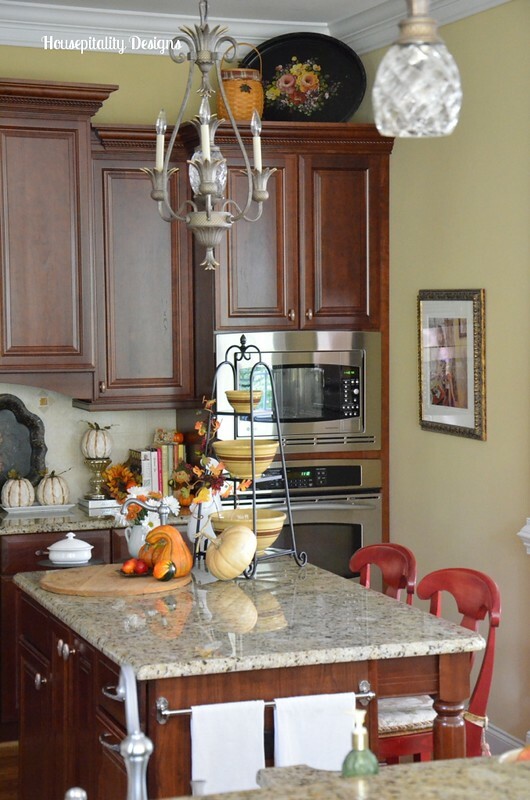 Fall Kitchen Tour….My New Sponsor….And a Giveaway! …..My new sponsor and a giveaway!!! 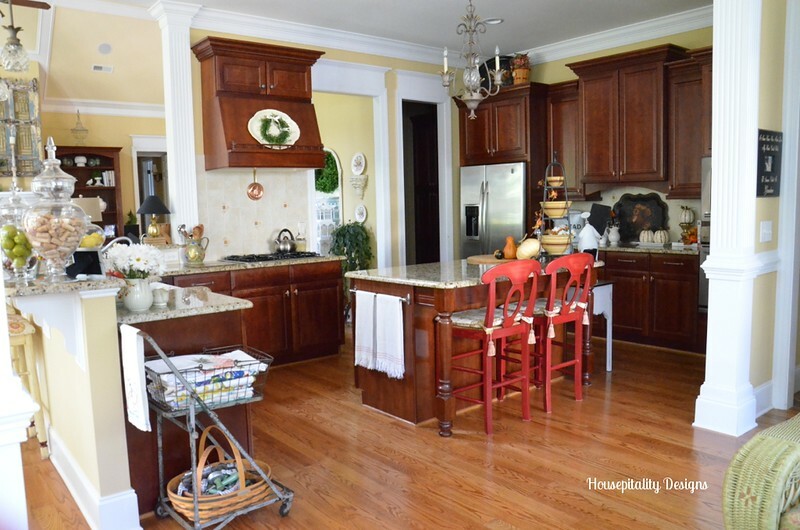 …..and my new kitchen cabinetry hardware…. Thanks to my new sponsor D. Lawless Hardware!.. …..and I “blinged” my master bathroom with these gorgeous octagonal crystal knobs. 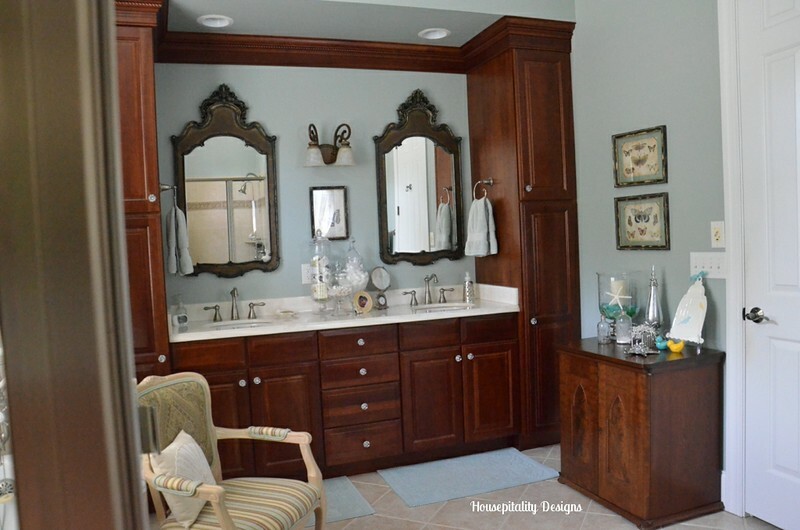 The crystal knobs just added much sparkle and “glamour” to the master bath. So today, D. Lawless Hardware would like to give away not one but two $50 Gift Cards…. 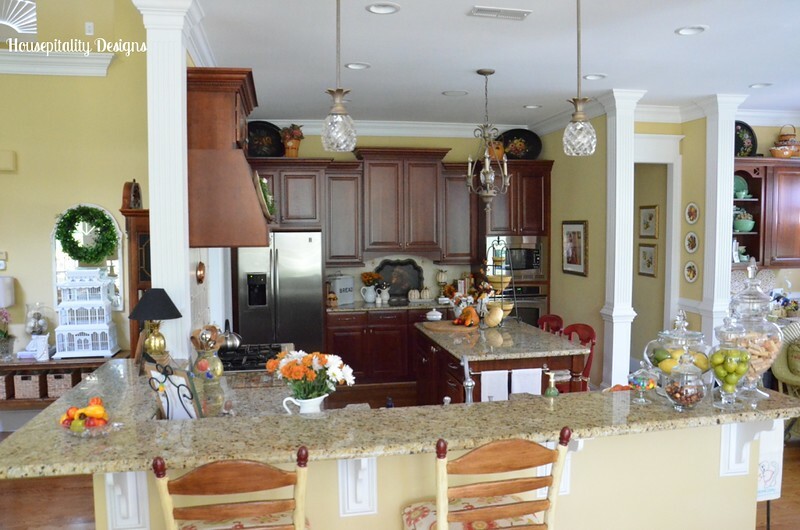 …..that my kitchen deserved a Fall Facelift. Maybe one day I will either paint or replace the kitchen island with a pretty color. But for now..I will continue to keep it interesting with color and decor. And a pretty little table to add more decor! 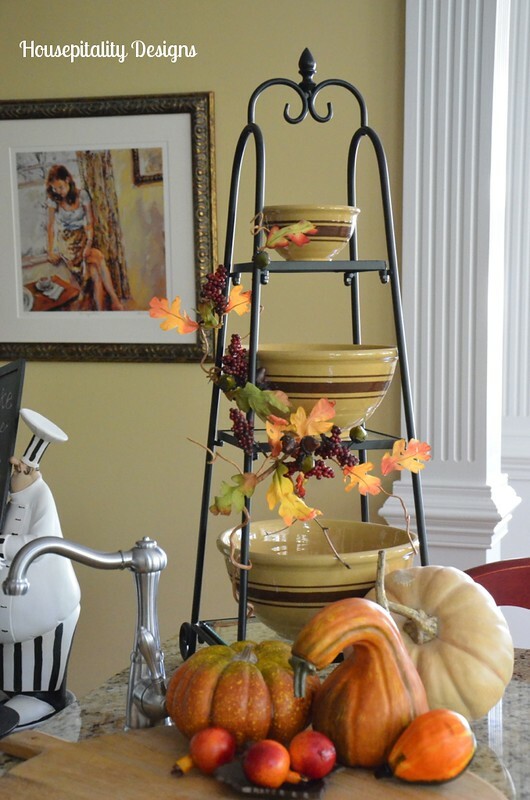 Added some Fall decor to the Yellow Ware Bowls. Most of you have already seen my collection of Jewel Tea Autumn Leaf. …..to give your home a seasonal look. …..with my A&P shopping cart nearby. 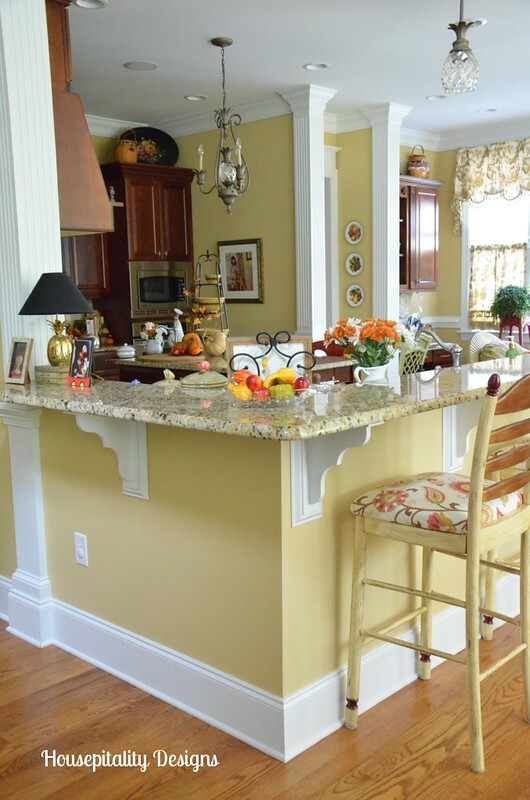 And your kitchen will be happy too by giving it a great facelift with beautiful hardware. So, good luck to you as you enter this great giveaway from D. Lawless Hardware!! Congratulations on your new sponsor! I love the updated knobs in both rooms! 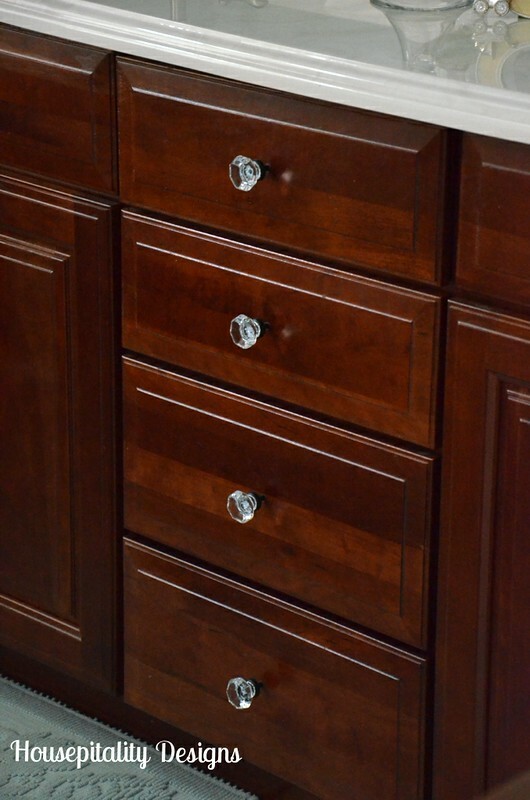 The copper knobs and pulls are so unique; they really make the gorgeous wood in your cabinets stand out! Thanks for hosting this great giveaway! I love the octagonal crystal knobs! They’re stunning! I love the new cabinet hardware. It’s amazing what a difference something as simple as new cabinet and drawer hardware can make without spending a lot of money on a complete makeover, especially when your cabinets and countertops are as gorgeous as yours! So pretty! Your kitchen is timeless and welcoming. Love all of your fall touches. I have a dresser that I want to refurbish and beautiful new hardware would add just the right touch! Well, there’s no confusion in your kitchen that Fall season is here! I just love the way you put the winding vine on the bowl stand. Beautiful, and I love the new hardware. If I win this drawing, I would love to get new hardware for my closet dressers. Love everything and admire your energy. See you Tuesday. 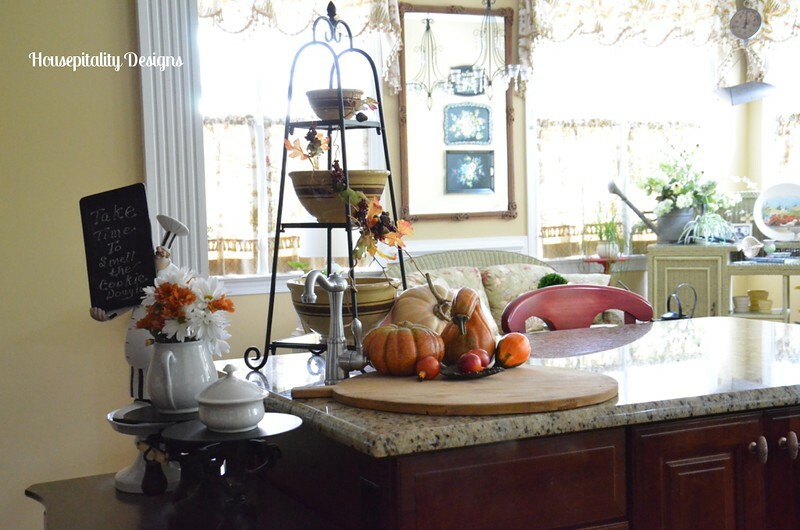 Your kitchen looks beautiful dressed for fall. Great hardware and thanks for the chance to win. Oh my! I need those glass knobs for my little girl’s new bedroom. She inherited a set of furniture from her great grandmother and those knobs would be the perfect touch to update the chest and dresser! All of your fall additions inspires me to do the same. The new kitchen knobs are lovely, but it’s the crystal ones that I would have to have. Thank you for this wonderful opportunity and for introducing me to a new source for cabinet hardware. LOVE everything. Nice big kitchen with island. I bet it’s wonderful to cook in. 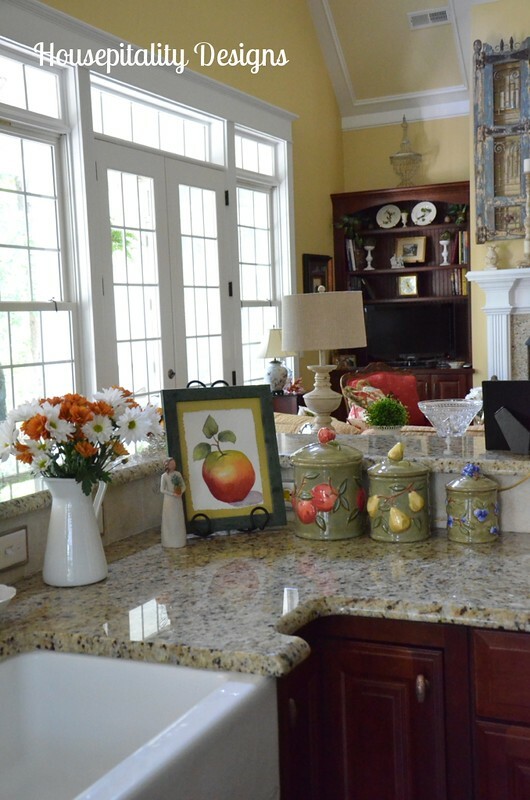 Love your Longaberger also…..
crystal knobs are the icing on the cake! 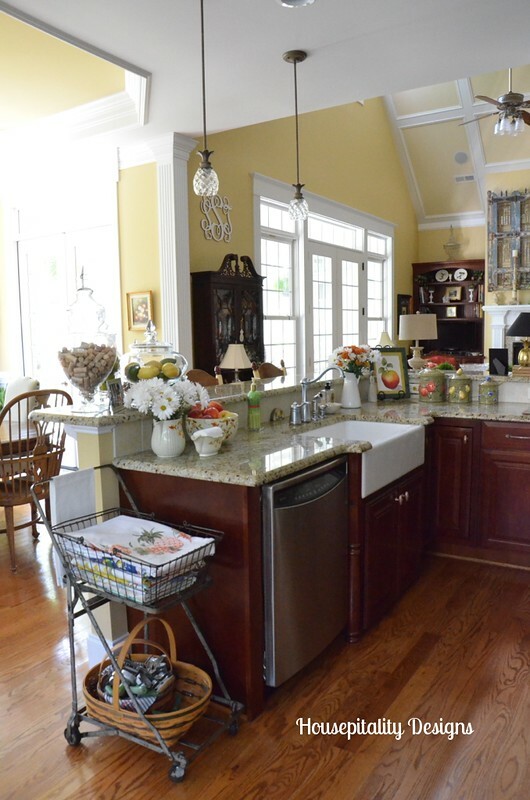 Shirley you kitchen looks amazing and now especially with the D Lawless Hardware! I love both of the hadware in the bath and kitchen. I now know where I’ll by my knobs and pulls for my new house. Shirley, Your kitchen is full of fall!!! LOVE those white pumpkins. And the hardware is wonderful. The crystal knobs on your dark wood… oh my, it it beautiful!!! Thanks for the chance to win! I sure could use some new hardware! I would love to win this and use it to spruce up the master bathroom vanities. 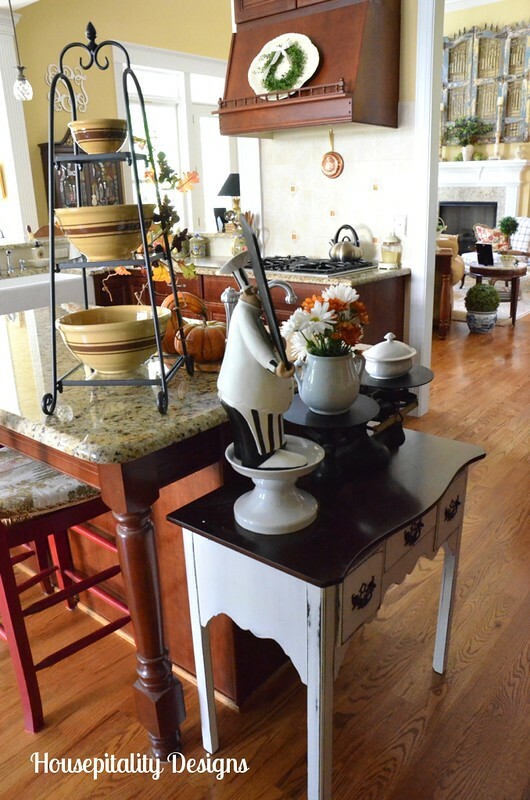 Love your new fall look for your kitchen and especially the new hardware on the cabinets. Love your kitchen! The new hardware is fabulous! Thanks for the opportunity and for introducing me to your new sponsor! Gee’s recent post…A Perfect day… and Horses. Shirley, your Fall touches are lovely! The copper hardware was the perfect compliment. I would love to win some new hardware. I am in the process of renovating my childhood home in Louisiana. This would be perfect! Congrats on your new sponsor! Your kitchen is very lovely and I love the hardware that you added. The fall items looks so good also. Love the bling in the bathroom. I love the A & P cart – it’s great! Wish I had one. Have a great weekend Shirley. Sweet! Congrats on your new sponsor! 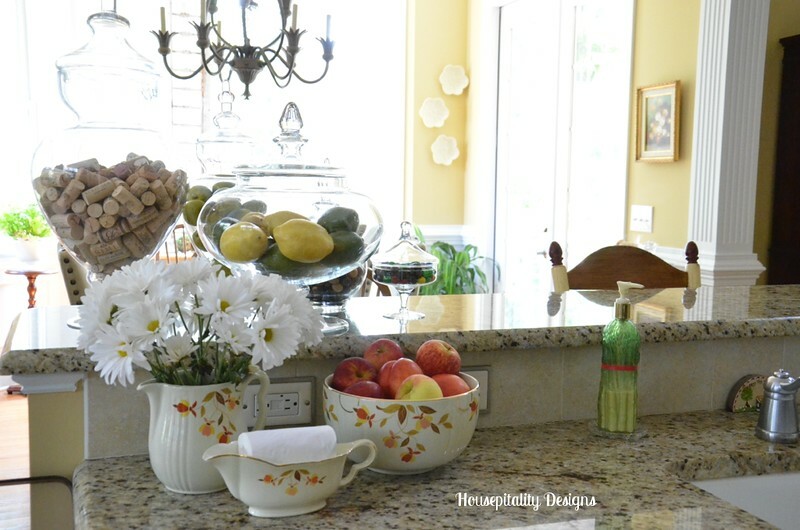 I love your pretty kitchen – especially those yellow ware bowls!! I adore those. The coat hooks are nice! My mom is handicapped and wall hooks come in handy. Right now she has a bunch of ugly plastic ones everywhere. There are some nice gifts on the site too! Shirley your kitchen looks beautiful!! I’ve always loved your beautiful kitchen, Shirley. And the new hardware looks greats. All of your fall touches are perfect! Nice to see some that aren’t so overwhelming. Great giveaway! I love all the antique glass cabinet knobs! Love your new hardware Shirley! The crystal knobs in your master bath are beautiful and look stunning against the dark wood! Congratulations on a new sponsor and what a wonderful giveaway! Mary’s recent post…Eat, Drink & Be Scary~ Giveaway! The hardware is so pretty. I love your crystal knobs in that beautiful bathroom. This is a wonderful giveaway thanks for the chance. Love your kitchen too. So gorgeous. Ahh just beautiful and cheery! I love it! They look gorgeous Shirley. Oh Shirley, your kitchen is bee-u-ti-ful!!! It looks so cheery! I can’t believe you are talking about hardware. We just (this morning) finished changing out all the hardware on our bedroom furniture…but I am looking for wooden knobs for the kitchen we are adding above the garage. D Lawless had some wooden backplates for their wooden knobs that look perfect for what I have in mind, but they are on backorder. Hopefully they will getting new ones in soon. Enjoy your weekend! i want new knobs for my kitchen cabinets and they have a great selection! Love the crystal knobs. Hope I win! Thanks so much! Congrats on the sponsor. They do have awesome hardware. I hope I win. Thanks for offering such a generous giveaway. Savannah Granny’s recent post…IS BLOGGING DRIVING YOU CRAZY? Love that vignette in your first and last photos! The tray does a wonderful job of pulling it all together. I’d love to have you link to Seasonal Sundays. Shirley, Your kitchen is so pretty all dressed for Fall. 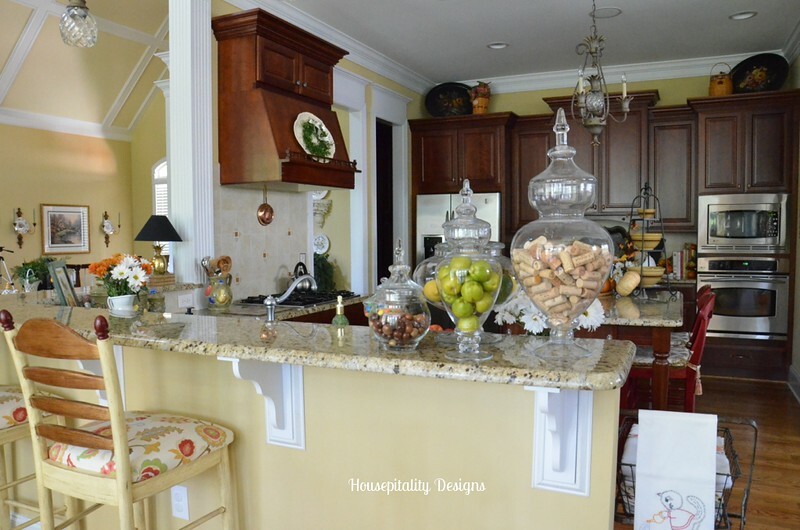 LOVE you cherry cabinets, the island, and the crystal knobs on you bathroom cabinets. Thanks for the Fall inspiration. The Oil Rubbed Bronze plates are lovely! Love your kitchen Shirley and your new hardware is so pretty! Congrats on your new sponsor! We are choosing cabinets now for our kitchen remodel, will need hardware very soon. 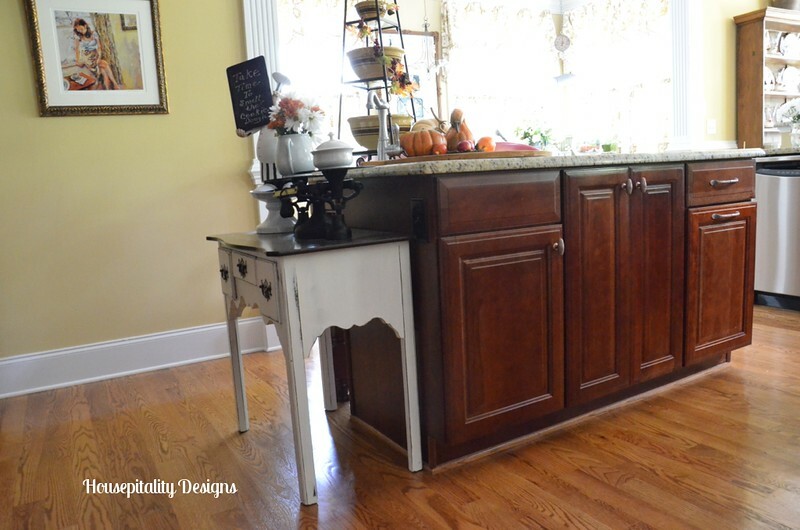 Your Fall kitchen looks fabulous! I love the holder that the bowls are in. Oh heck, I love it all! You have a beautiful kitchen, and the new hardware is great. It does sparkle! One of my aunts had the Jewel Tea Leaf dishes. I remember eating many meals on these dishes because I spent a lot of time at her home. I’ve never known the name of this pattern. Your fall touches are just perfect! Love the new hardware. The copper is gorgeous with the color of your cabinets. You have such a beautiful home and I love all the fall décor. Enjoy reading your blog every day. Marty@A Stroll Thru Life’s recent post…An author amongst us. I am back Shirley…mental block. I really love the clear glass pumpkin shaped knobs!! I didn’t know you were going to France. Lucky you, I found out on FB. Have a great time and hope you find some goodies!!! I absolutely love your kitchen!!! Copper is one of my favorite metals so I Love It!!! Congratulations on your new sponsor!!! I am loving all the crystal bling! What a great addition to your bath. Shirley I LOVE your decor style! I you always leave me oohing and aahing! Beautiful and inspirational as always! Those are the tallest kitchen ceilings I have ever seen. Wow, what a great bright space. Thanks for the giveaway opportunity. Hi Shirley, I love your pretty fall kitchen decor! The Jewel Tea Autumn Leaves reminds me of my grandmother’s house when I was a child, and I LOVE your tole tray. Don’t you love to freshen up everything with the change of seasons? 🙂 Your new “cabinet jewelry” is just lovely. Thank you for the chance to enter to win a giveaway from this company! So sad that I missed this, Shirley! We were at the lake so the widget wasn’t loading for me with our limited internet service! 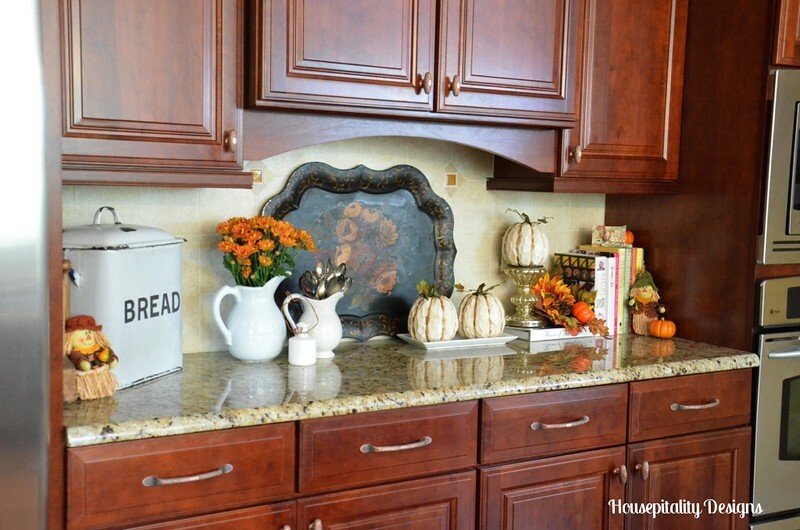 Congrats on your new sponsor AND on your lovely kitchen all decked out for fall! I hope you are having a great vacation! I love that fabric on your barstools & the dishes! I’ve had my eye out for a stand similar to what you have your bowls on….love that you have displayed vintage dishes! And as always, I love your tole trays…the copper hardware is pretty, too! You can never go wrong w/ copper! Hope you find some great stuff in France! I just LOVE everything!! I got alot of ideas from this post. Where did you find the light fixtures in your kitchen? I love pineapples. Happy Fall! I adore your kitchen! You deserve an award for your decorating- Love it ! I don’t think I could live without color …. Connie Lenden’s recent post…I’m thinking about wallpaper lately…….